Colón was honored with the Franklin H. Williams award on October 8 for his commitment to community service. 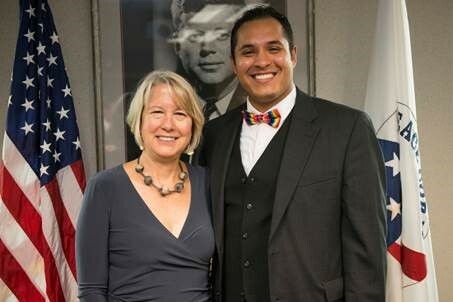 Peace Corps Director Carrie Hessler-Radelet honored University of Illinois graduate Manuel Colón and five other returned Peace Corps volunteers with the Franklin H. Williams award on Wednesday, Oct. 8, during a ceremony at Peace Corps Headquarters in Washington, D.C. The award recognizes returned Peace Corps volunteers from ethnically diverse backgrounds who exemplify an ongoing commitment to community service and Peace Corps’ Third Goal of promoting a better understanding of other peoples on the part of Americans. As an environmental education Peace Corps volunteer in Paraguay from 2010-12, Colón carried out sustainable tourism development work, youth group education, and cultural exchange activities. His most successful project was a national environmental youth group workshop conference called “Paraguay Verde,” which fostered youth interest in environmental stewardship and is now in its fifth iteration with current volunteers in Paraguay. But for Colón, Peace Corps service was about more than gaining skills and helping others overseas – it was about sharing his experience with people back home and inspiring others to consider making a difference. Even while he was still a volunteer in Paraguay, the Chicago native kept in touch with friends and family and used Skype to chat with prospective applicants at a recruitment event. While home on leave during his two-year service, he was the featured speaker at a 200-guest send-off event for new volunteers in Chicago. As the New Volunteer Coordinator for the Lesbian, Gay, Bisexual, and Transgender Returned Peace Corps Volunteers association, he works closely with Peace Corps’ Office of Diversity and National Outreach to engage prospective, current, and returned volunteers, in addition to promoting recruitment and Third Goal activities to the Queer community through the group’s social media. Both in his everyday life and while working, Colón never misses an opportunity to share his personal Peace Corps story with diverse audiences. At his alma mater high school, Whitney Young in Chicago, Colón recently spoke to students about the way Peace Corps could, one day, transform their lives, as it has transformed his. 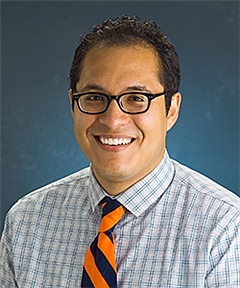 In the summertime, he enjoys drinking tereré (Paraguayan iced tea) and listening to music from Paraguay, sharing the country’s culture with his friends and co-workers in the U.S. This year he waved the Peace Corps flag at multiple Pride events, inspiring countless LGBTQ Americans to serve. Colón’s commitment to bettering his world also extends beyond Peace Corps’ Third Goal. He currently volunteers with the University’s Intensive English Institute as a conversation partner, helping students from South Korea and Saudi Arabia improve their English and learn more about American culture. “The parallels to Peace Corps pre-service training are so strong, so I'm glad I can give back to visitors to our country the same way I was so warmly received by the people of Paraguay,” Colón said. As the preeminent international service organization of the United States, the Peace Corps sends Americans abroad to tackle the most pressing needs of people around the world. Peace Corps volunteers work at the grassroots level with local governments, schools, communities, small businesses and entrepreneurs to develop sustainable solutions that address challenges in education, health, economic development, agriculture, environment and youth development. When they return home, volunteers bring their knowledge and experiences – and a global outlook – back to the United States that enriches the lives of those around them. President John F. Kennedy established the Peace Corps in 1961 to foster a better understanding among Americans and people of other countries. Since then, more than 215,000 Americans of all ages have served in 139 countries worldwide. Visit www.peacecorps.gov to learn more.